RME's Fireface 800 is the world's most powerful FireWire audio interface ever. 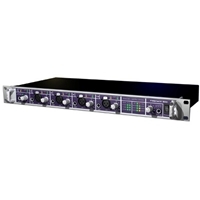 Up to 56 channels record/playback, up to 192 kHz sample rate, and true FireWire 800 sum up to an unsurpassed high-end, high performance and high speed FireWire audio interface. Since the Fireface first shipped in July 2004, the unit became the reference for FireWire audio - and still is today! Lots of 'world's first' and 'world's only' features put the Fireface 800 far ahead of the competition.